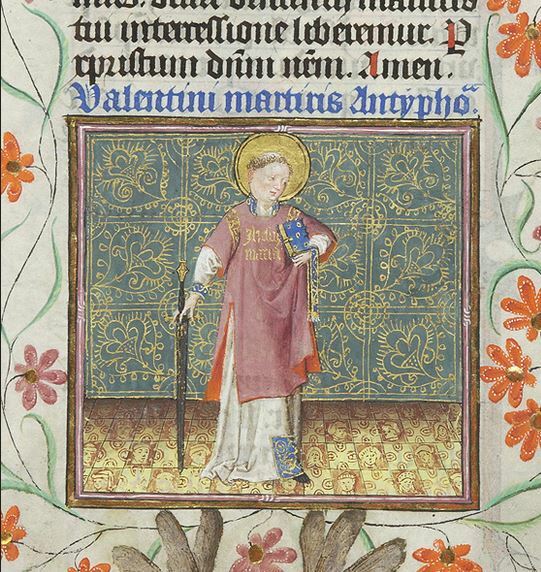 Celebrated annually on February 14 as a day for courtship and romance, Valentine’s Day began as a liturgical celebration in honor of one or more Early Christian martyrs named Valentinus. The Roman Martyrology mentions two Valentines, both of whom were decapitated on the ancient Via Flaminia, the main artery connecting the city of Rome to the Adriatic Sea. One Valentine died in Rome and seems to have been a priest. The other, who may have been a bishop, was martyred approximately 60 miles away at Interamna (modern Terni). The earliest extant connection between Valentine’s Day and romantic love appears in Geoffrey Chaucer’s Parlement of Foules (1383): “For this was on St. Valentine’s Day, when every bird cometh there to choose his mate.” February 14 was associated with courtly love as early as 1400, in a charter ostensibly issued by Charles VI of France (d. 1422). 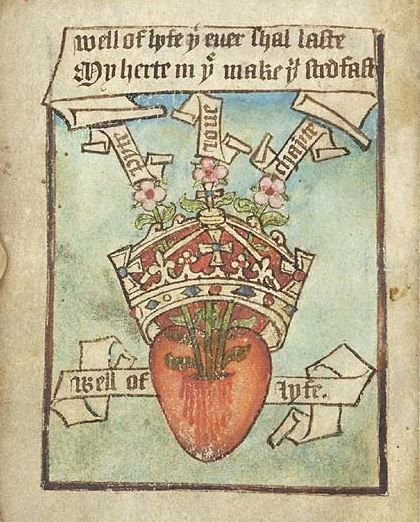 The text describes the festivities of the royal court, which included love poetry competitions, dancing, jousting, and a feast. Contrary to popular belief, there is no firm evidence linking Valentine’s Day with the ancient Roman Lupercalia, a pastoral festival observed from February 13 through 15 to purify the city of Rome and to promote health and fertility. 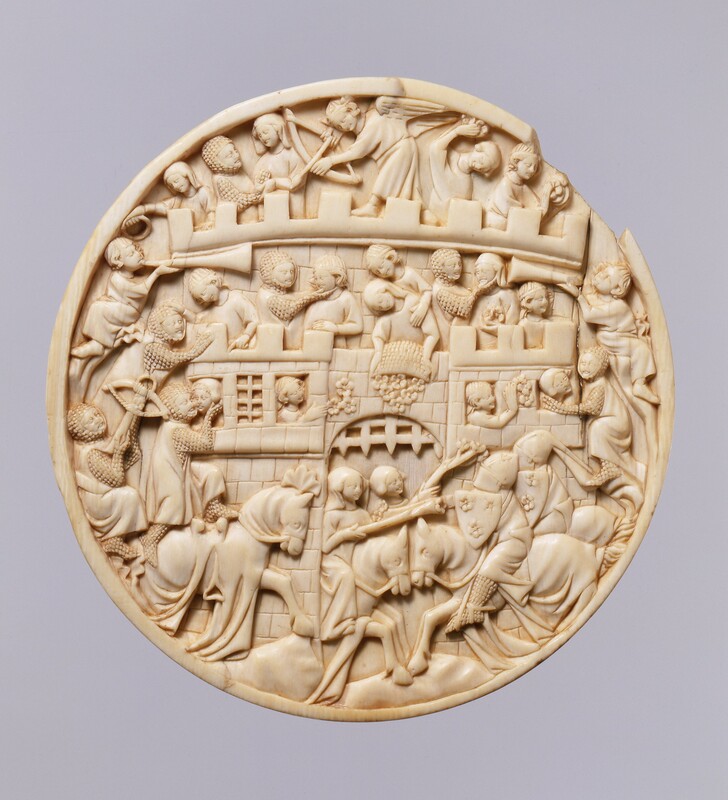 Attack on the Castle of Love, New York, The Cloisters Collection, 2003.131.1, c. 1320-40. The Index of Christian Art is delighted to present four images thematically associated with Valentine’s Day. 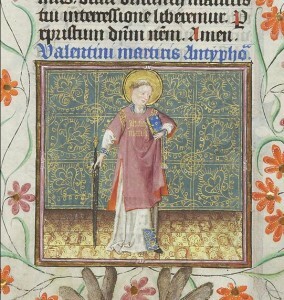 First, the nimbed Valentine of Rome is represented with the sword of his martyrdom in the fifteenth-century Hours of Catherine of Cleves (Morgan Library, M.917 and M.945). 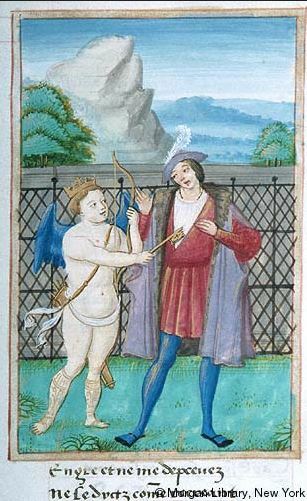 Second, a sixteenth-century Roman de la Rose contains a charming depiction of the God of Love locking the Lover’s heart with a giant key (Morgan Library, M.948). 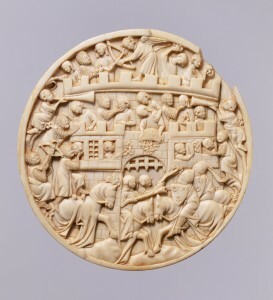 Third, a fourteenth-century ivory box cover of Parisian origin shows women defending the castle of love, a popular subject in late medieval courtly circles. The winged god of love at the top of the roundel prepares to launch his arrow, while women throw flowers at the attacking knights. 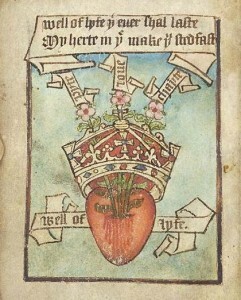 Last, a sixteenth-century drawing from an Arma Christi and Prayers (Princeton University Library, Taylor 17), which portrays Christ’s heart with three blossoming flowers, is inscribed pyte, love, and charyte.